When Gulfstream Park resumes racing on Thursday it will have a carryover of $102,569.72 on its Rainbow 6 and a mandatory payout of the carryover/jackpot—no matter the number of winning tickets. Based on patterns on mandatory payout days it is likely that bettors will add well over $100,000 to the Rainbow 6 pool. Gulfstream on Thursday also will have mandatory payouts on the Late Pick 5 and on the Rolling Super Hi-5. 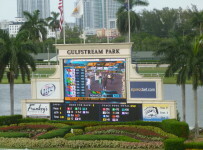 Thursday is the final day of Gulfstream’s spring meet and of Florida’s 2015-2016 fiscal year. Thus, it cannot have any carryovers going into Friday when it begins its summer meet. 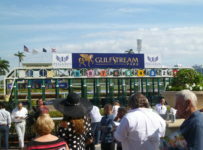 Gulfstream will have ten races on Thursday with first post at 1:15 p.m. The Rainbow 6 will begin with the fifth race. It is a 20-cent only bet that requires picking the winners of each of the last six races. A ticket can have multiple horses in each race, and thus multiple 20-cent combinations. Thursday’s Rainbow 6 races have 53 entrants. The Rainbow 6 carryover going into Sunday’s card was $87,227. Bettors wagered an additional $63,936 on the Rainbow 6. There were 27 tickets with all six winners, and each received $1,325.88. Per its rules on non-mandatory payout days, Gulfstream added approximately $15,000 to the carryover. Gulfstream usually pays out the Rainbow 6 carryover and the day’s new Rainbow 6 bets (minus 20 percent takeout) only on days when there is just one ticket with all six winners. On other days Gulfstream divides 56 percent of the Rainbow 6 bets among tickets with the most winners and puts 24 percent into the carryover. 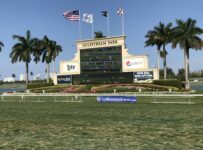 On Thursday, Gulfstream will pay out the carryover and 80 percent of the day’s pool-dividing it among winning tickets. If there are no tickets with winners in each race, five-of-six becomes the winning ticket for the day. Sunday was the 13th straight day without the usual jackpot/carryover payoff of just one ticket with all six winning horses. Sunday’s results provide an example of how a combination of large fields, large pools and the lack of any longshot winners can lead to multiple winning tickets with a payoff that is attractive—although not life-changing. There were 55 starters in the Rainbow 6 races. Three of the Rainbow 6 races were won by favorites. The highest-price winner, at 5-1, was We’re All Set in the $75,000 Sea of Grass Stakes. The Super Hi-5 is $1 minimum and requires picking the first five finishers of a race in exact order. If there are no such tickets in a race, the pool is carried over into the next race with seven or more starters. In Friday’s tenth and final race, the pool including any carryover will be paid out even if there are no tickets with all five places correct. The closest tickets, such as four of five places, will be winning tickets.